Conflict of interest: that’s the obvious punch line. 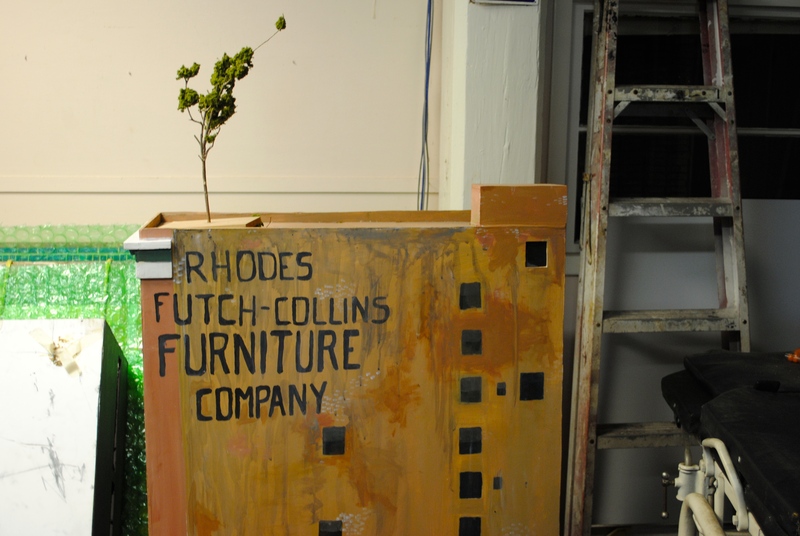 But it’s only an urban legend that a chute once ran from the casket factory into Old St. Luke’s Hospital. By the time the three-story brick casket factory was built in the 1920s, the hospital had moved north to a new building in Springfield. Old St. Luke’s was built in 1878 and functioned as Florida’s first hospital for almost 40 years. 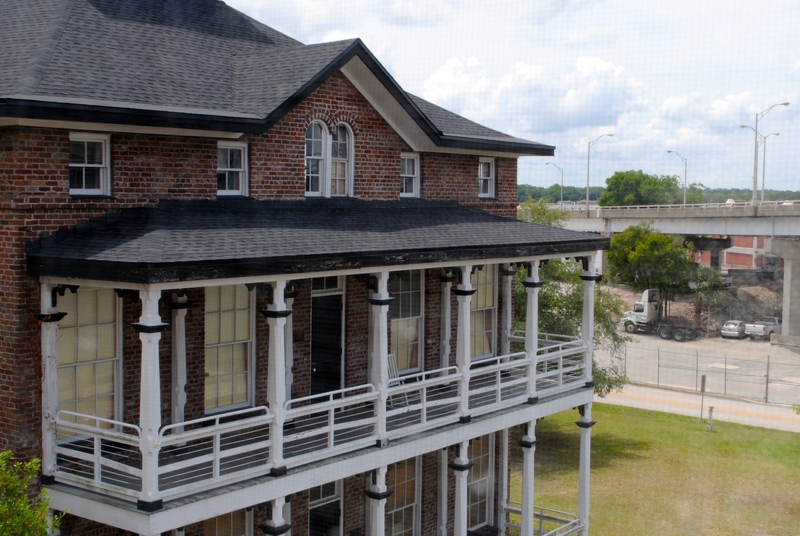 Today it’s the archives building for the Jacksonville Historical Society and the Casket Factory Building serves as storage and a great locale for the society’s annual Halloween Bash. What happened here after St. Luke’s left its original structure behind is unclear. The building went into private practice, but at some point the casket factory expanded into the hospital building. This end-of-May morning, I meet my friends Dana and Hurley and Lauren at one of the oldest buildings in the heart of the city. Dana’s a local history professor and Hurley manages production for a cultural variety show called Swamp Radio and writes and draws a serial comic called Girl Crush. 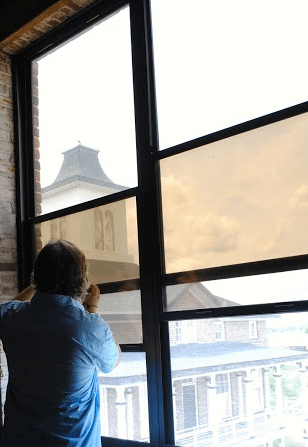 Lauren Elizabeth Swain Mosely comes to work every morning in this three-story 136 year-old building fronted with two-story balconies and topped with a cupola. She’s the Historical Society’s archivist. Lauren is kind and gracious and enthusiastic. Her husband Paul is a University of North Florida librarian whose best friend is Jim Alderman, the just-retired UNF Special Collections librarian who guided me through researching the great humanitarian Eartha White for an upcoming book. Oh, and Lauren’s and Paul’s dog Sadie looks just like mine and my wife’s dog Penelope. Lauren has a crate for Sadie in her office. Though the interior 1980s’ Pepto Bismal paint job makes her “stir crazy,” Lauren frequently feels the depth of historical change and all the living that’s happened through this building. Then there are stranger things. Like when she’s working alone in her office and the phone in the nearby elevator rings. The phone was installed in the 1980s so you could dial out if the elevator stopped with you in it. The line remains connected for emergencies. “So it’s just a random wrong number when the phone rings,” I say. So the history of Old St. Luke’s includes dozens of phone lines with no present record that seem to have fallen through cracks in the walls or timelines or technologies. That means maybe “ghost lines,” not paranormally, but as subway systems include ghost tunnels and stations that aborted without remembrance decades or a century before. When Lauren’s working alone in her office, cops come out and ask if everyone’s okay. “What’s weird is the phone number is not a phone number the Historical Society’s ever had. It’s not a number the Arthritis Foundation had here before us. It’s not an active line here. But when it pops up to 9-1-1, the cops come and this is the address the number refers them to. But it’s not a physical line here at all.” The number also fails to appear in the switchboard box rusting in a wall upstairs. When the Historical Society first assumed the building, the 9-1-1 calls happened several times a week, but now they occur less frequently. The society’s had present and previous telecommunications and security companies investigate, but none of them can identify the line. We’re standing beside old Yellow Fever journals, a wheelchair, and a box of electrocardiograph cards, and we seem to concur that as time goes by, things get lost. Those things include identities, subway tunnels, and phone lines, and it’s clear to me we all have similar senses of wonder and reverence for history as haunting. If haunting were other than historical, Lauren says (and if so, how could it be greater? ), this building would be the place to experience it. So many people have died here, even outside the early Yellow Fever epidemics, though in 1888 Jacksonville was entirely quarantined, and Old St. Luke’s was the epicenter. After a private medical practice abandoned it sometime in the 1950s or 1960s, the state’s original hospital remained abandoned until 1975, when a businessman using the casket factory for warehousing demolished both hospital wings and was ready to take down the central original structure. But a group of distraught citizens founded Old St. Luke’s Restoration, Inc. and started a “Bucks for Bricks” campaign, selling the bricks from the wings to finance purchase of the whole site. 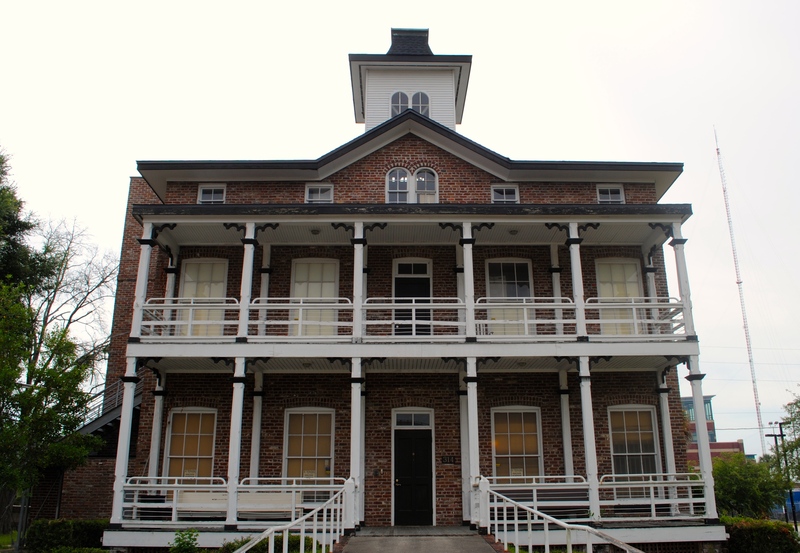 Between the hospital’s salvation from demolition and the Historical Society’s purchase from the Northeast Florida Arthritis Foundation in 2012, U.S. Representatives Charles Bennett and Corinne Brown both used Old St. Luke’s as campaign headquarters. 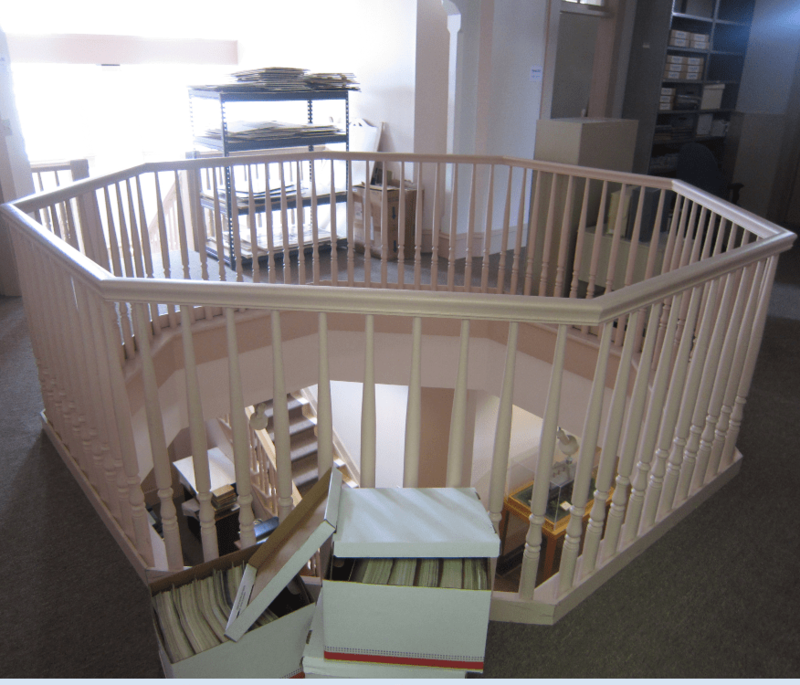 Bennett’s first-floor office is now the Charles Bennett Reading Room. This building’s lived as much life as any other structure in the city. A century before serving as political campaign headquarters, Jacksonville brought its Yellow Fever victims to tent camps by Hogans Creek and their adjacent sole municipal hospital. Yellow Fever outbreaks occurred every few years, but 1888 was the apocalyptic year. On the first floor, near the old wheelchair, an array of steel surgical tools, a 1940s Viso-Cardiette electrocardiograph machine. Lauren shows us early journal entries and letters dictated from the hospital. “October 18, 1894, the month I was 23, I entered the first trained nurses’ class of St. Luke’s, a small 30-bed hospital. “I had never seen many people die, and this made me very sad. When I would be off-duty, I would lie across the bed and have hysteric fits of weeping. Trained nurses in the South were not plentiful at that time. I was soon put on night duty. “One had lockjaw. One hemorrhaged from TB. One young boy shot in the abdomen accidentally by his best friend. One had his face nearly shot to pieces. “We had no electric lights in Jacksonville. We used small kerosene oil lamps. I had to make the rounds every hour and go downstairs to the two men’s wards. “Most of the deaths were in private rooms and doors opened in the main hall upstairs and I was nervous. So after everything settled down for the night, about 10 p.m., I closed the doors and put lighted lamps in front of each. “When I came back from my first round, all the lamps were out and the doors were open. I thought it was the wind, so I closed the doors and re-lit the lamps. They opened and shut several times. We walk up the stairs to the second floor. Once the octagonal lightwell let the brutal bright Florida sun shine down from the cupola and accompany a downdraft toward the swamp-center-of-gravity. In various rooms, Lauren shows us collections bequeathed. Though Noble family archives extend down from old-family wealth to Mary Noble’s gardening and food columns that result in numerous 1950s’ Jell-O recipes and “You Too Can Grow” orchid and native-plant gardening guides, the family also planned and planted urban and municipal gardens. “You just never know what’s in here,” Lauren says. She points to the Cuban Consulate Collection and the papers of Joseph E. Lee, the first black attorney in Jacksonville. Many items from Jacksonville University have made their way into the archives with little or no provenance. Nobody knows, for example, if the heavy shackles lying on a second floor shelf were used for slaves or prisoners. 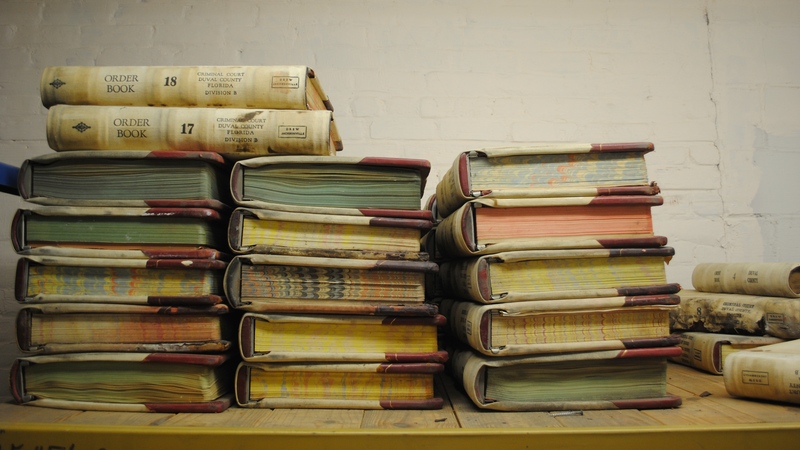 Another shelf contains 19 thick binders of notes made by someone named Virginia King. In 1960, she wrote and published a book called Interesting Facts about Leading People and Families of Duval County: Also, Where Progress Has Changed a Lot of Homes and Buildings. By 1977, she’d published a fifth edition that stretched to 869 pages. Her notes are numbered and those in the binders reach beyond 10,000. Random glances through her random notes find mentions of the opening of an assisted living tower, a suburban convenience store, and an old brick Riverside house used as doctor’s offices. Virginia King would show up at seemingly random places with her camera, take several photos and write notes, take more photos and then more notes. She lived alone and never married, unless she was wed to documenting the life of her city—whatever the activity, whatever the location, and I find myself smitten, although I’m sure she’d probably “semi-scowl” at my fascination. Elsewhere in the archives, Lauren’s found a box of Polaroids with the same handwriting as in the binder notes. The photographs are of various buildings with notations of who used to live in them or what year they were built. Virginia King is Jacksonville’s Outsider Historian. Flipping through an index typed some decades ago by an anonymous person at Jacksonville University, we briefly get excited when Hurley reads, “Life of Virginia.” For a second, I foolishly imagine we’ve found the whole collection’s Rosetta Stone. Then Hurley continues, “for the San Jose Office Center,” and Lauren points out that “Life of Virginia” is the name of an insurance company. Toward the elevator, the only way to the third floor, we pass boxes of shoes designed by Joseph LaRose. I remember going into his shoe store on West Monroe Street, where the Main Branch library stands now. He sold his designs to Jackie Kennedy and actresses like Betty Grable, Joan Crawford, and Jayne Mansfield. It seems almost nobody comes from Jacksonville and remains, but Lauren, Hurley, and I (s0 far) belong to that small club. Dana’s lived “everywhere” in the state, from Jacksonville to Tampa to the Keys, so we laugh about her being qualified to teach Florida History. 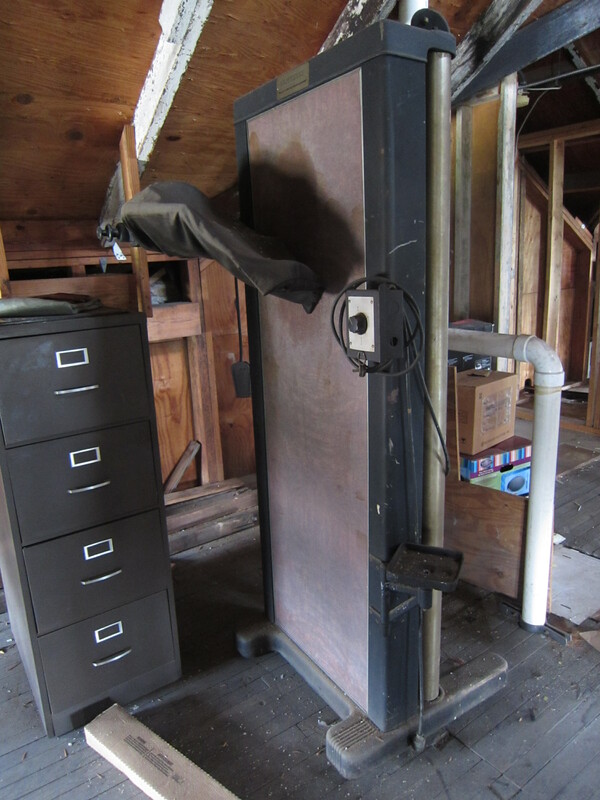 The elevator ascends to the third story, really a full, high-ceilinged attic, and requires Lauren’s key to do so. Before we step out, she opens the little door to the phone that sometimes rings from some unknown external connection. When we walk into the attic, she leaves the key active, so the door continually bings and bounces several inches between closing and remaining open, banging rapidly back and forth. Steel beams from 1980s’ reinforcements minimally scaffold the wide open space. Old wooden beams stretch through the rafters, blackened from a fire sometime around the turn of the 20th century. But these beams are heart-of-pine, which was sometimes burnt for strengthening in housing construction, like steel processed from iron. Early legends claim nurses lived on the third story, and if they did, it may’ve been the coolest place in the building in the summers, with surrounding windows open for breezes up above the ground. The windows in the cupola would likewise have been open. 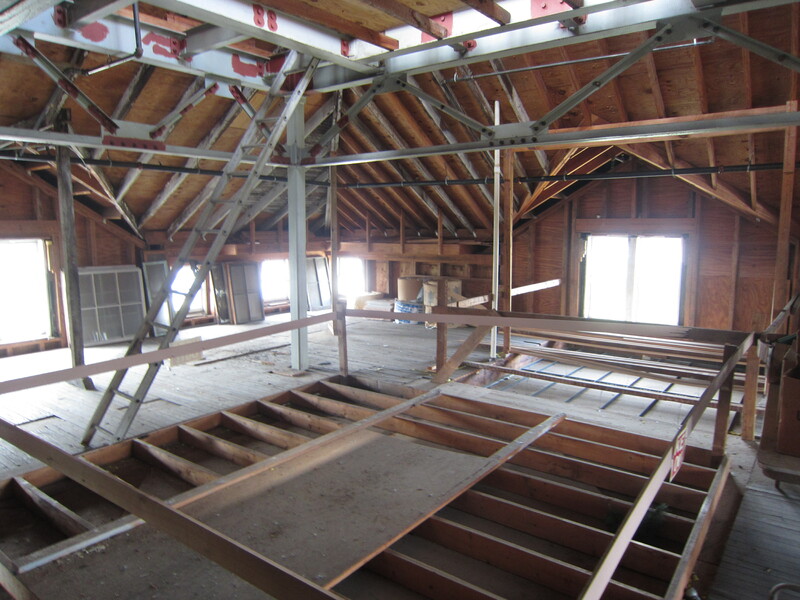 Now the attic floor is boarded, making necessary the elevator ride, but originally the light and the upper drafts down from the cupola would have reached through the lightwells in the center of the building to the ground floor. 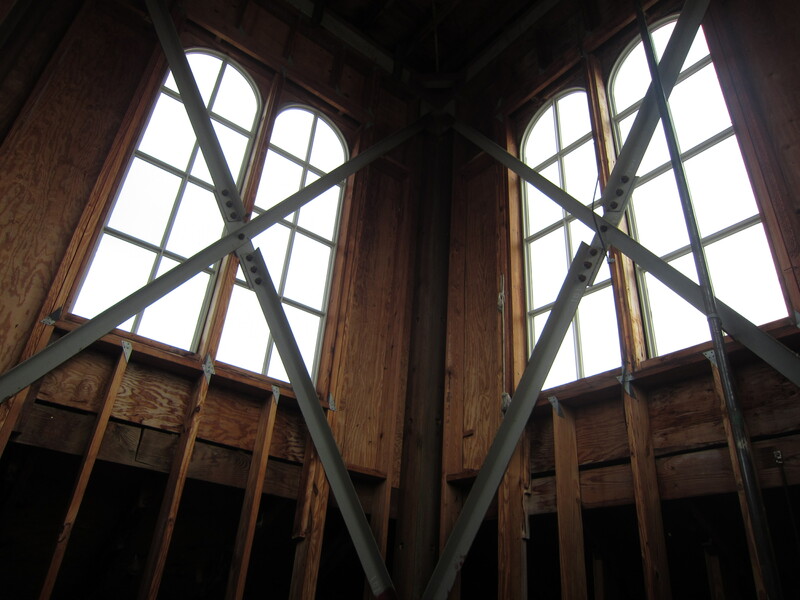 I climb the ladder that leads into the cupola and come into the space between four dual eight-paneled windows, one each direction, reinforced now by steel-beamed x-frames. We wander the open-floored apex of the building and stand before a long-cast-aside x-ray machine, lead aprons and gloves lying nearby. 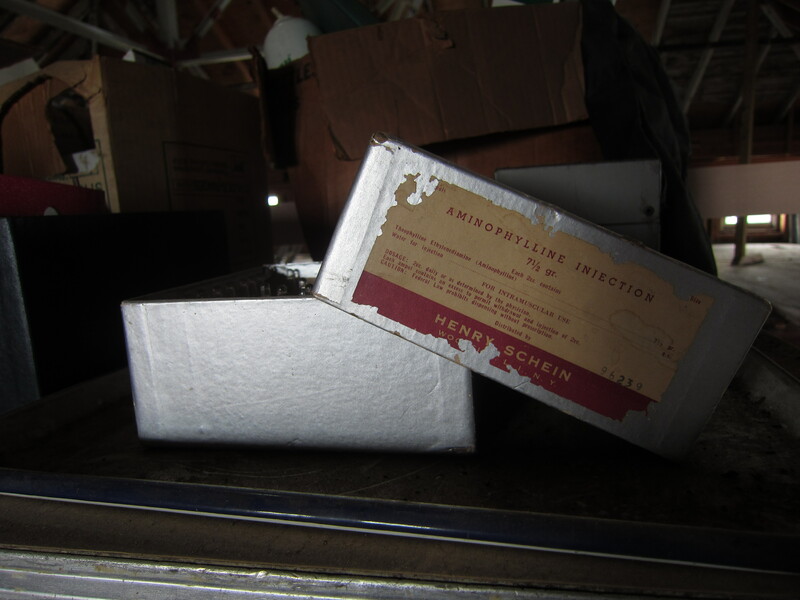 We look through boxes of old glass vials containing mercury and tubes of “Aminophylline Injection, 7 ½ grams” and stand before a chipped-paint medicine cabinet important and vestigial by a high bright window and upright oxygen tanks. 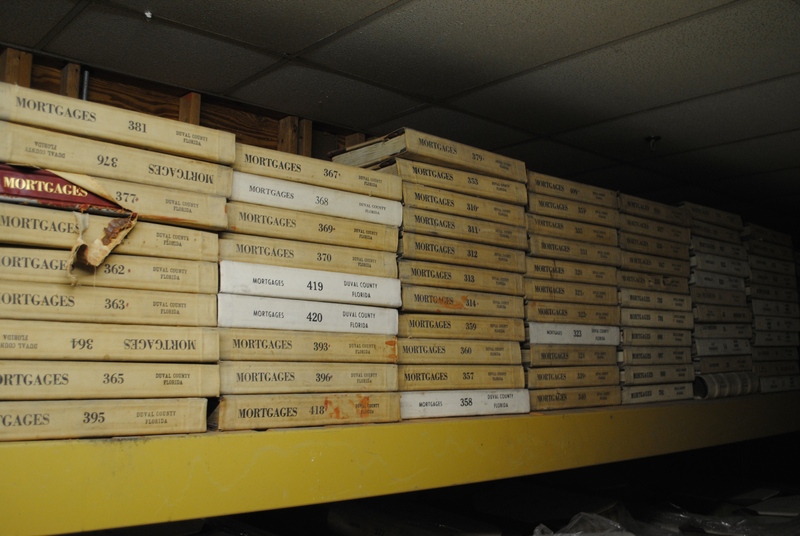 “This isn’t how we’ll permanently store these items,” Lauren wants us to know; in fact, City Hall was throwing all these records in the trash until a city employee saved them and had them transported here. 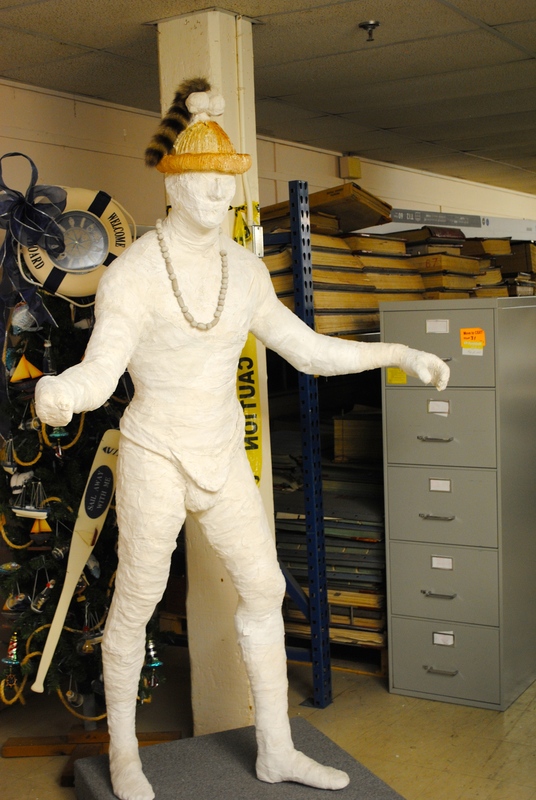 We encounter papier mâché Timucuan Indians and models of skycrapers demolished within the last 20 years, coming to the casket factory’s third floor. But the peak of Old St. Luke’s 1878 central hospital is the pinnacle of my experience of this place. We’ve ascended the phantom-connected elevator to the original clerestory peak, which once sent light and air down the lightwell of the building. We come back to the elevator, its key still jammed, its door yet urgently but exactly in frantic time threatening to close-open / close-open / close-open / close-open—schick-omp, schick-omp, schick-omp, schick-omp, schick-omp, schick-omp, schick-omp, schick-omp. She discovered the gap when a rat descended the spaces between them and died. I picture Lauren sitting at her computer by bay windows of a prior century, her dog Sadie bounding about the first floor from her crate, when one dead rat reminds her not just intellectually of historical changes in paradigm and the order of society, but of individual possibilities and physicalities and the traces of each of our individual earthen lives.